Ouagadougou Airport, renowned for its endless queues and mosquitoes, is both a military and civilian airport serving Ouagadougou, the capital city of Burkina Faso, a land locked country with a population of nearly 16 million in north western Africa with one of the lowest GDP per capita in the world, a fact reflected in the austerity of its airport. Serving around a quarter of million passengers a year, the airport handles flights from Air Algerie, Air France, Air Ivoire, Air Mali, Brussels Airlines, Ethiopian Airlines, amongst others, and of course the domestic Air Burkina. Senegal Airlines has recently started operating with flights in and out of the airport in recent months. Ouagadougou Airport is situated just 1km outside the city and is deprived of any real facilities, not even having a luggage belt or hotel to stay in, although its close proximity to the city centre means this isn't much of a problem, with a taxi there costing less than £2.00.This video shows a charter flight descending into Ouagadougou Airport. A video about life in the capital city of Burkina Faso, Ouagadougou. 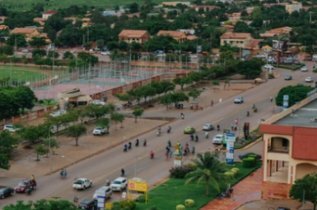 A video documentary together with facts and figures about daily life in Burkina Faso. 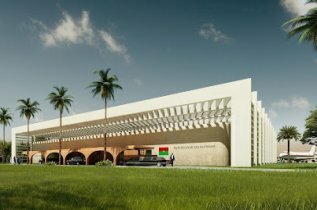 Read facts and figures about Ouagadougou airport close to the capital city of Burkina Faso then make a virtual landing this video.